Castle Comfort Stairlifts offers top brand stairlifts, keen prices and fast installs for all those seeking stairlifts in Nottingham, Nottinghamshire. And all work comes with our no-quibble guarantees and famous customer service satisfaction. What is the city of Nottingham most famous for? Robin Hood and his Merry Men, Lace-making or stairlifts? With a retired population of almost 60,000, you might not be surprised to know that about 1,500 of them already own stairlifts and no doubt more will very soon. How do we know? 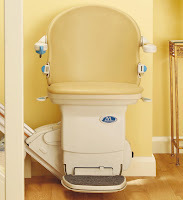 Well Castle Comfort Stair Lifts who of course supply and install them in the area, keep an ongoing counter on our website of percentages of the retired population and the number of them who have stairlifts. If you live in the area and think that having a stairlift installed could benefit you or a loved one, please get in touch with us by calling 0115 971 7012 . The outlaw Robin Hood must surely be one of the most famous inhabitants of Nottingham. It is believed he lived in the very late 12th century to the early 13th century whilst King Richard was away at the Crusades. Legend has it that Robin wasn’t happy with the taxes imposed by the King’s brother, King John in Richard’s absence. Being dissatisfied with the tax system sounds all too familiar doesn’t it? To try to put this right, Robin famously robbed the rich to give to the poor. The real Robin Hood is hard to identify. It seems that Robin Hood became the name for an outlaw and the Robin Hood of legend maybe an amalgamation of several outlaws and even of different time periods. His Merry Men and Maid Marian may also be combinations of other outlaws of different times. However for now I am sure we are all happy with the legend and the Robin we know. Nottingham certainly is. The city uses Robin as an active tool in self promotion, Nottingham castle – the home of the Sherriff of Nottingham, Robin’s arch rival - and of course Sherwood Forest. You can follow a Robin Hood walking ‘Trail’ in the city or the longer ‘Tour’ by car with downloadable ‘sat nav’ guide. Sherwood Forest was the ‘home’ of Robin and his Merry Men. It belonged to the King and was where deer hunting took place. 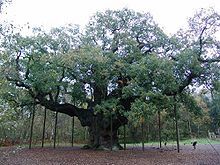 It is still home to the famous Major Oak, a tree that is thought to be between 800 and 1000 years old and according to legend was Robin’s principal hideout. From Victorian times the tree has been stabilised by scaffolding. Some years ago a local company took cuttings to try and cultivate new trees with the idea of sending them to major cities around the world. As you can see even the sturdiest of us like the Major Oak need support as we get older. If we can help you be more mobile and remain independent by installing a stairlift then please talk to us. We represent all UK stairlift manufacturers and will be happy to come and talk to you and assess your staircase to decide which stairlift. 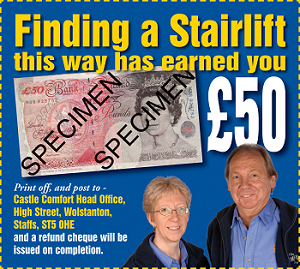 If you are concerned about the cost, you can see our stairlift prices on our website and remember we have reconditioned models too. There are also other means of help to assist with the costs like grants and 0% finance. Just give us a call on 0115 971 7012 for more information. The Industrial Revolution brought prosperity to Nottingham as it did to many other UK towns. It was the textile industry and lace-making in particular for which Nottingham became famous. Like many other industries that sprang up at that time, few have survived in changing times. The lace-making industry is no different and fell into decline following the Second World War losing business and production to factories in the Far and South East Asia. However Nottingham has been left with a great legacy of industrial buildings in the Lace Market district of the city, many of which have been restored and are being reused. Nottingham was also well-known for the manufacture of bicycles. It was the birthplace of Raleigh Cycles, later joined by Sturmey-Archer (gears). Of course Nottingham hasn’t stood still. It is still the HQ of nationwide chemists Boots which was founded in Nottingham. It is the European HQ of Capital One, the Driving Standards agency and Nottingham Building Society. Other companies based here include Experion, E.ON UK, John Player & Sons, Gala Group and Siemens. Not forgetting local boy Sir Paul Smith’s fashion house HQ. The Lace Market area still has streets full of four to seven-story red brick warehouses, ornate iron railings and red phone boxes. The Adam’s Building from the era is now occupied by New College Nottingham whilst many others have been converted for modern use as apartments, bars and restaurants. The largest medieval building still standing in the centre of town is St Mary’s Church. Shire Hall, a Georgian building, once the town court and prison, is now home to the Galleries of Justice. Speaking of old buildings, Ye Olde Trip to Jerusalem pub in Nottingham is a contender for the title of oldest pub in England. It dates back to 1189. Of course in friendly city rivalry two other pubs dispute this! Ye Olde Trip is definitely the oldest building but for much of its life was a brewery rather than a pub. Ye Olde Salutation sits on the site of the oldest recognised public house site but the actual building is relatively new and was originally built as a tanner’s workshop. The Grade II listed Bell Inn the other contester, boasts the oldest public house building which was once a refectory for monks! The Trip as the first of these pubs is known locally is at the foot of Castle Rock. The caves which were burrowed out of the sandstone when the castle was built form the rear bars of the pub on the ground level. Those below ground were once the brewery. It’s not just Robin Hood and his band that can claim Nottingham as their home. We can’t promise you’ll be swishing round the ice like Torvill and Dean but we can make that trip up or downstairs much easier! Watch our founder Keith’s video to learn all about stairlifts and then give Castle Comfort Stair Lifts a call so that we can get you mobile! Telephone our local office on 0115 971 7012 for more information.